On display in the Curriculum Resources section of the library we have a selection of work by pupils from St Peter’s Primary School, W9. 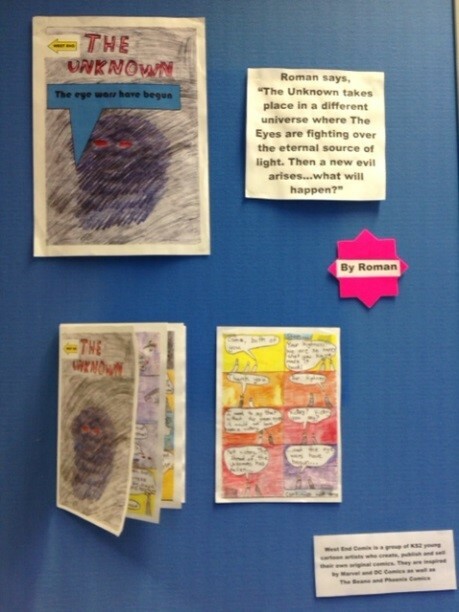 The work is the result of a project run by NQT Maureen Pepper with a group of reluctant readers who met twice a week at lunchtimes and were introduced to graphic novels and supported to create their own work. 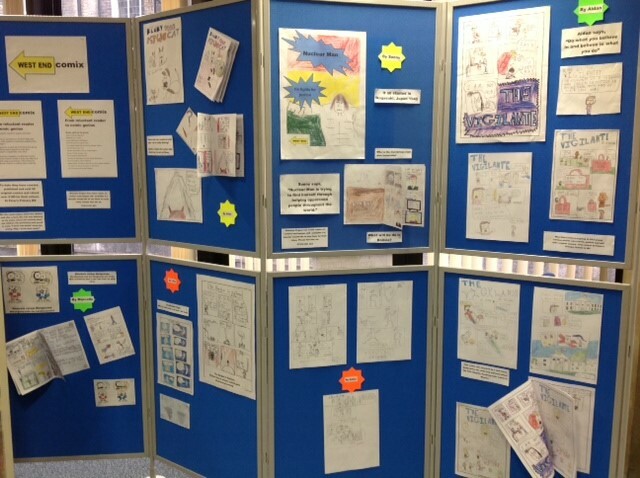 West End Comix, as the cartoonists chose to be known, produced an inspiring array of publications, and sold copies of them to raise money for the school (£180 to date). The artwork was used to produce badges too, and Maureen explains ‘this was very effective as the entire school was wearing them and children who previously were proud to state “I don’t read books” were now saying “Hey, I wrote that comic”’. And we are very privileged to be able to enjoy that creativity in the library. The graphic novels used by Maureen to launch the project are listed in the display, and examples of them, along with other graphic novels from the Curriculum Resources collection, are available to borrow. Come and have a look. The display is at the far end of Level 4 and runs until the end of February. This entry was posted in Curriculum Resources, Library and Archives and tagged Comics, Curriculum Resources, graphic novels, literacy, reading, Reluctant readers. Bookmark the permalink.